Going to a Israel Swimming Pool is increasing especially within the elderly population sectors of Israel, who have suffered some type of muscle or bone damage. Please use the make contact with information supplied at each pool profile to check if they are offering aquagym lessons, due to the fact isn't so common to see an Aquagym in Israel. For Israel and its vicinity, we're showing you all the registered pools, some of them have no GPS coordinates and cannot be found on the map at the map. Do you know of any Pools in Israel that should be listed here? Contact us!. Regular users of the following Israel Pools told us the most critical point about swimming is to manage your breathing. Sometimes this is not possible because we raise the neck to breathe along with the body is not aligned. To avoid this, our head should be aligned with our spine all of the time. Before trying any pool, make sure you know the rules and regulations for Israel Pools as they may not be precisely the same as in your home town. We advise you contact the pool directly to ask if you will need a hat, and what sort of footwear or specific clothing you will need. There are several reasons why you should choose a heated swimming pool in Israel. One of the most important one relies on the importance of keeping the body temperature stable. If the water is too cold, your body will try to warm it up and you will lose strength to swim properly. Enjoy the best indoor pools in Israel and don't worry about the weather. These facilities are open all seasons and you can enjoy a swim at the same temperature every day of the year. One from the advantages of outdoor swimming in Israel may be the possibility to sunbathe during the summer season. Taking it with additional care, sunbathing is healthy since introduces Vitamin D into the body, so the perfect option seems to be switching amongst indoor and outdoor pools depending on the season. If you're tired of possessing eyes and irritated skin, finding a saltwater pool in Israel can be the solution. It's best to know that the level of salt from these pools is well below the level of salt from sea water, specifically they are talking about a tenth or less. It's hard to visit Israel without dropping by Ashdod (with 224.656 residents). At present Swimia is showing you all the Swimming Pool in Ashdod along with the closest pools located in its vicinity. Without a shadow of a doubt, swimming in Jerusalem is the ideal option to unwind after work. 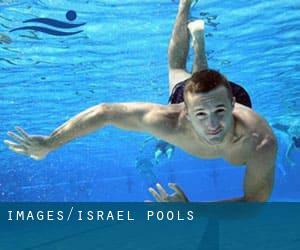 Take a couple of minutes to browse Swimia's catalog to find a Swimming Pool in Jerusalem. Let us tell you a secret to switch off while you will be in Tel Aviv Yaffo: just choose a Swimming Pool in Tel Aviv Yaffo and plunge into the water! There's no more powerful method. Hachasmonaim st. 72 , Kiriat Motzkin . This sports center offers 25 meters, Indoors. For this Swimming Pool, only phone number is number here. Updated on 2019 Tel Aviv University , Haim Levanon , Tel Aviv (Postal Code: Unknown). This great and large sports center lets professional swimmers like you enjoy Olympic size, 8 lanes, Outdoors. Additionally, within these facilities you can try 25 meters, 6 lanes, Indoors. Unfortunately we do not have the email address of this Swimming Pool, but we can give you the phone number. Edmond de Rothschild, 10 , Barne´a , Ashkelon (Postal Code: 78421). Among all the activities provided by the center, if you are interested in swimming you will delight in 30+m, 5 - 6 lanes, Indoors. Just in case you want to contact this Swimming Pool before dropping by, we only know the phone number. Updated on 2019 Liberty Bell Park, 3, Jabotinsky St. , Jerusalem (Postal Code: 92145). Swimmers like you reported 25 meters, Indoor/Outdoor. Unfortunately we do not have the email address of this Swimming Pool, but we can give you the phone number. Independence Park , Hayarkon St. , Tel Aviv (Postal Code: 63495). Among all the activities supplied by the center, if you are interested in swimming you will enjoy 20 meters, 6 lanes (striped), Salt Water, Outdoors. Just in case you want to contact this Pool before dropping by, we only know the phone number. 19 Bikurim Street , Haifa (Postal Code: Unknown). Swimmers like you reported 25 meters, 8 lanes. Unfortunately we do not have the e-mail address of this Swimming Pool, but we can give you the phone number. Updated on 2019 Granot Junction on Route 65 , Kibbutz Gan Shmuel . Among all the activities supplied by the center, if you are thinking about swimming you will enjoy 25 meters, 5 lanes, Indoors. Just in case you want to get in touch with this Swimming Pool before dropping by, we only know the phone number. Updated on 2019 Weitzman Shopping Center , At Dizengoff Street and King George V Ave. , Dizengoff , Tel Aviv (Postal Code: Unknown). Among all the activities offered by the center, when you are interested in swimming you can expect to enjoy 20 meters, 8 (narrow) lanes, Indoors. Just in case you want to make contact with this Swimming Pool before dropping by, we only know the phone number. Updated on 2019 Perry Eliezer 14 , Tel Aviv . Swimmers like you have reported Olympic size, 4 lanes + 40 meters, 4 lanes + 40 meters, 4 lanes, Salt Water, Outdoors. Also, you will find 20 meters x 12 meters, Outdoors. Just in case you need to contact this Swimming Pool prior to dropping by, we only know the phone number. Off Route 581 , Giv´at Hayyim . This sports center offers 25 meters, Indoors. For this Swimming Pool, only phone number is number here. On Route 4 , Netanya . Few days ago a regular user of this center told us they offer Olympic size, Outdoors. Furthermore, they keep in good conditions 25 meters, Outdoors. For this Swimming Pool, only phone number is number here. Harei Yehuda Neve Ilan , Jerusalem (Postal Code: 90850). Among all the activities offered by the center, when you are interested in swimming you can expect to enjoy 25 meters, Indoors. If you need to make contact with this Swimming Pool, email address and phone number are both number. Updated on 2019 Beit Millennium , 4 Weitzman Street , Ra´anana . This sports center offers 25 meters, 4 lanes, Indoors. Contact information for this Pool such as phone number and email address are number. Overlooking Coral Beach , Eilat . This sports center offers 25 meters, Outdoors. For this Swimming Pool, only phone number is number here. 34 Yehuda Ha´nasi St. , Ramat Aviv , Tel Aviv (Postal Code: Unknown). This sports center offers 25 meters, 5 lanes, Indoors. For this Swimming Pool, only phone number is number here.